Truly a favorite in perennial borders, the daylily (Hemerocallis) performs faithfully every year. Easy and rewarding plants to grow and care for, they are also popular in beds or mass plantings on hillsides where they prevent erosion. The oldest and most common daylilies are orange or yellow, often found growing in the wild or in drainage ditches along roadways. They are known by the common name "ditch lily" in some areas. Each plant produces a number of slender flower scapes held high above the foliage with numerous buds forming on the top. One bloom opens each day and then fades. The foliage is a graceful grass green mound with upright slightly arching strap-like leaves growing from a fan shaped crown. Depending on the variety, individual leaves can be 12 to 24 inches long and stay green all during the growing season. Flower stalks are 1 to 6 feet tall - again depending on variety. There are currently over 20,000 daylily hybrids ranging in color from the palest yellow almost white through burgundy. Many are bicolor with different colors on alternating petals. Some are double or frilled. Photo shows a single blossom with multiple buds awaiting their day to bloom. Most daylilies bloom in late spring to early summer but there are others that begin blooming later or even have a secondary bloom cycle later in the year. 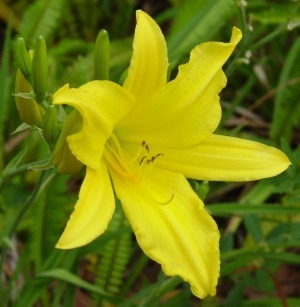 By carefully selecting varieties it is possible to have daylilies bloom all through the growing season. Daylilies can be grown in full sun or partial shade. They are tolerant of most any well drained soil but prefer rich slightly acidic loam. Good drainage is a must. Although considered drought resistant, plants benefit from regular deep watering every week or so especially during dry spells. Fertilize lightly in early spring and once again during summer. New plants may be started from seed but are generally grown from division of the root clumps. Seeds can be harvested after the growing season when capsules which form on the scapes mature. Seed is ready when capsules are completely dry and are beginning to split. After 5 years or so, daylily plants can become quite large and crowded. Divide your daylily clumps in early spring or late summer. Lift the entire clump with a shovel or pitch fork. You can then pull or cut it apart into several individual sections. Plant divided portions to the same depth they have been growing. Bury the fans no deeper than one inch below the soil line. Another method of propagation is from proliferations. These are small plantlets that develop along the flower scape of daylilies. They can be easily rooted in individual pots by cutting the scape an inch or so above and below the plantlet. Fill individual small pots with moist seedling mix and stick in the cuttings up to the base of the plantlet. Keep moist - roots should form in about a week to 10 days. Besides occasional slugs and grasshoppers, the only other pests that may prove serious are aphids and spider mites. Check your plants often and apply the appropriate bug juice or dust to control any problems.